Happy Wednesday, friends! 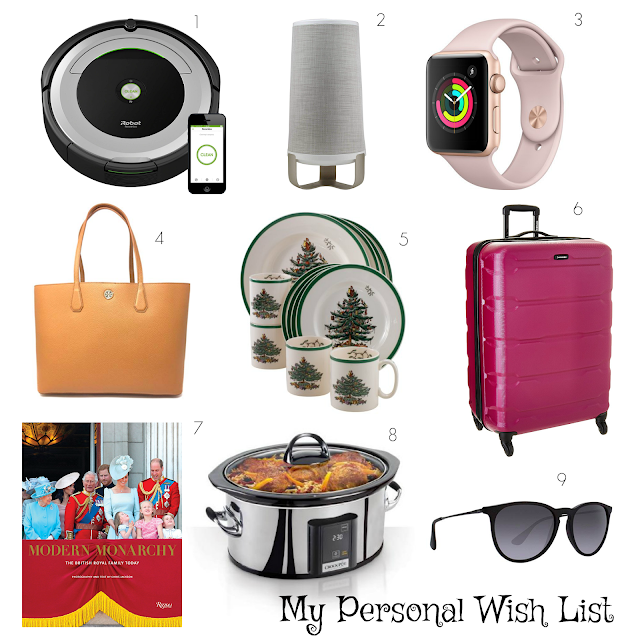 Two weeks ago, I shared an Ultimate Gift Guide for everyone on your list (you can see that here) and today I'm sharing my personal wish list. Of course, Christmas (to me) is so much more about the kids and seeing the joy on their faces when they open gifts is so much more fun to me than opening gifts of my own. But, I have had people ask me for ideas, so I wanted to compile them here, too. I'm a germaphobe/clean freak through and through, so I really have been wanting a Roomba for a while! I seriously run my vacuum three times a day to clean up after the boys, so not having to do that at least once a day will be helpful to me. Again with the germaphobe/clean freak, so this continuous clean system is right up my alley. It continuously vacuums dirt, dust and dander from the air, so surfaces stay cleaner. I constantly have my phone with me, and I've had my current watch for years, so combining my phone and a watch together is something I really want! I'm constantly missing calls because I'm upstairs with the boys or have left my phone in the car, so an Apple Watch is something that will really help me! 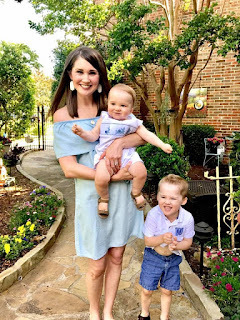 Now that both boys are potty trained, I really don't have a need to carry my giant "mom bag" everywhere I go that holds diapers, wipes, a changing pad, extra changes of clothes, Wet Wipes, hand sanitizer, water cups and my wallet/sunglasses/keys/etc. for me. Crazy! I have loved this pretty bag for a long time and feel like it would go with a lot in my closet. My grandmother started this Spode Christmas set last year and I would like to continue to complete the set so I have service for 12. I can't wait to use the four-service set she got me last year for our Christmas morning breakfast this year! I have had my current soft-sided luggage set since high school graduation (so embarrassing), so I am really wanting some new, updated, hard-sided luggage. And, I always like to get luggage in a bright color so I can easily identify it in the airport. It's no secret that I love the British Royal Family, so this coffee table book by Getty photographer Chris Jackson is something that I really want this year. I have heard the photographs are just beautiful. Our Crock Pot is one we got at a wedding shower eight years ago and is cracked. So, I'm really wanting/needing a new one! I love that this one is programmable. These are the sunglasses Meghan Markle wore to her first public appearance with Prince Harry in 2017 and I'm obsessed with them! I have a heart-shaped face and need something bigger to make my face look a "normal" size. I love these! I am so obsessed with our Roomba! That Spode dinnerware is such a classic! It makes me very nostalgic for Christmases at my grandparent's when I was young. So beautiful! I collect the Spode Christmas collection, too! Tip: you can get pieces at T.J. Maxx or Tuesday Morning for a crazy good discount around Christmas. I am putting together a service for 16 and ask for more pieces each year from family! We have enough glasses and dinner plates but are still completing our salad plates/accessories. Ok, so we got the shark robot last year and love it and is not as $$ and Jason researched the heck out of them. Get the apple watch, life saving! I will get my godmothers spode set someday, I just love it. You totally need that book. Did you hear that apparently Harry and Will had a falling out over Princess Meghan because harry didn;t think Will and Kate rolled out the red carpet enough? I dunno... and those sunglasses are so cute. A Roomba would definitely be nice!! Of course my #1 is that Apple Watch! That coffee table book has been one of my faves lately.. and my MIL just got me a roomba as an early Christmas.. it's literally charging right now so hopefully it's awesome haha! Check out the Ninja Foodi. My mom got one about a month ago and absolutely loves it! !